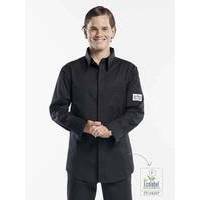 A traditional Chaud Devant Chef Shirt worn as a chef jacket. This tailored design contributes to a well-groomed look and offers the ultimate level of comfort thanks to the side splits. The blind fastening affords it a neat finish and the collar stays perfectly straight thanks to the collar stay inserts. The Chaud Devant Chef Shirt is the ideal solution for anyone who prefers to work in a shirt rather than a jacket.